As always it's an Alpinestars Jacket. That means CE rated shoulder and elbow bio armor. Temperfoam back and chest panels. Also it has a 360 degree zip, 1.4 mil cowhide and locking arm zippers. Why is the 2009 Alinestars Vector Leather Jacket so special you may ask? 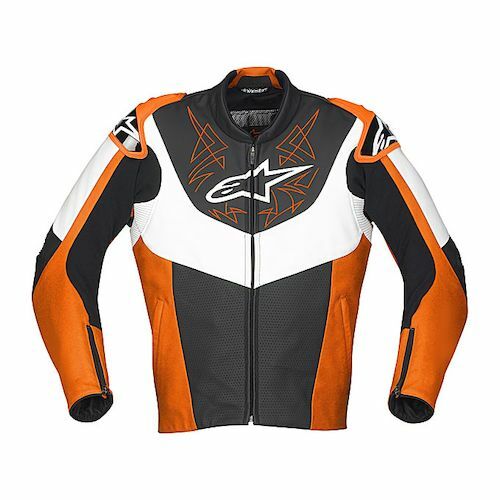 Two reasons in my book, one is the external hardpart armor, perf'd leather and race features which are a nice upgrade for the price of this jacket - $549. The other noteworthy element is the color orange. Yup it's KTM ORANGE - I can't show you many race level leathers with full track functionality that come in one of the most exotic moto colors around - orange. This jacket is a medium to high end leather with a reasonably aggresive preshape, race fit and all of the elements that make this a great track coat but give it some everyday sport riding range as well. Like I said, its got its own flavor and all of he track attributes you need - but orange? KTM Orange. So nice. Now off to buy my RC-8, I already know what jacket I'm rocking.